Our first bonfire of the season. It's been a lovely week here. We've been on a few frugal family outings and I've also just been pottering around, tidying up and baking of course. I also stocked up on a few items on clearance that will make great gifts. Here's this week's frugal tasks. 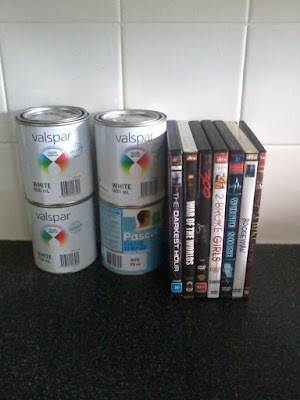 -Gratefully accepted some paint sample pots and DVD's from a friend. Thanks D! -Picked up some free reclaimed bread from the op shop again. 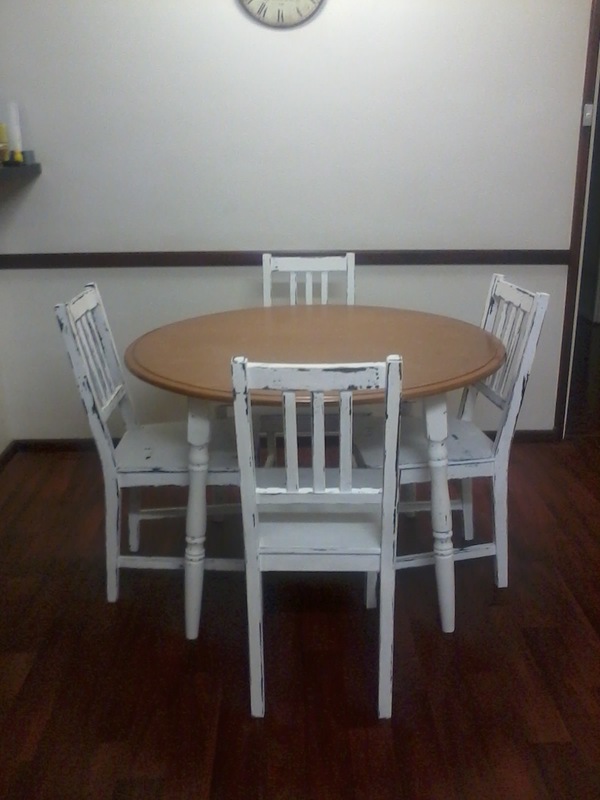 -Finished sanding down my kitchen chairs and table and gave them a coat of wax. I'm really happy with how they turned out. 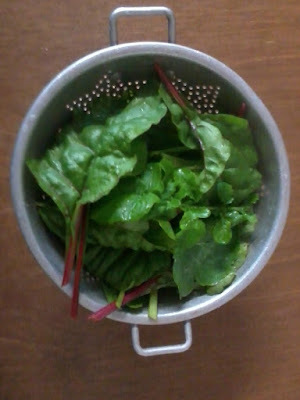 -Picked some more salad greens for a few nights dinner from our garden. -Gave myself a frugal beauty morning. I used a blue clay mask, and found a recipe for a homemade coffee hair colour. I also trimmed my fringe. All using items I had at home. -Went for an bush walk down by the river and play at the park on a sunny afternoon. The Autumn weather here has been really strange. Hot and sunny one day and then cold and wet the next. -Did lots of washing on a fine day, including sheets and throw rugs which were all hung outside. - I made some room spray for the toilet. Recipe is in the cleaning tab. -Visited our local orchard for some cheap apples at $1 a kilo. -Called into a little cheap shop and found some paper doilies I was looking for. They had several packs available and I picked the pack with 40 inside rather than 10. This store also had a clearance on glass bottles for $1 each. I picked up 7, then went back the next day and bought another 10 using our gifts fund. This will boost up my gift cupboard significantly! They were cheaper than op shop prices even! I got some small blue ones, larger coloured ones and milk bottle types too. I thought the small ones would be good for soy candles, the larger ones for homemade biscuits and the milk bottles I could put bath salts in. 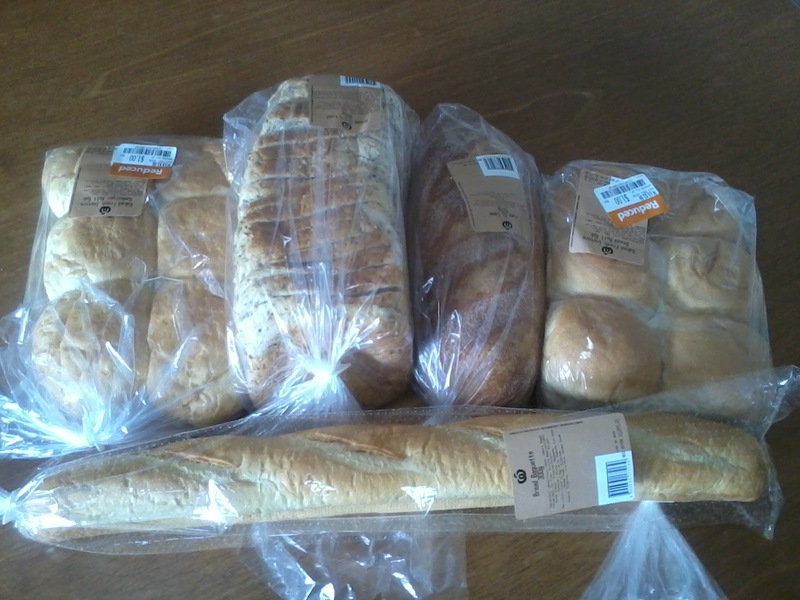 The lady at the store also wrapped the jars in tissue paper, so I got a large stack for free! I will use these for wrapping gifts. -I used some of the paper doilies as toppers for the homemade sweet mustard pickles I made last week. They look lovely and are a nice change from my regular paper toppers. -Tidied up my food cupboards and did a bit of grocery shopping. I still have a lot in my stockpile, but we have friends coming to stay soon and I wanted to to make sure I don't run out of essentials. 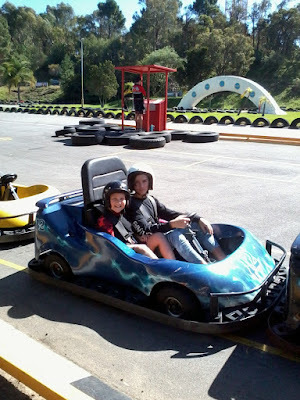 -We went to Adventure World using 3 free tickets that a friend gave us- thanks B! And only needed to buy 2 tickets which another friend got us a discount on, thanks K! We packed all our own food and drinks and although the place was incredibly busy and the lines for rides were long, we had a good time. I defrosted a large container of chicken and lentil soup for dinner as I knew I would be too tired to cook. -On Friday night we had a bonfire using scrap wood. 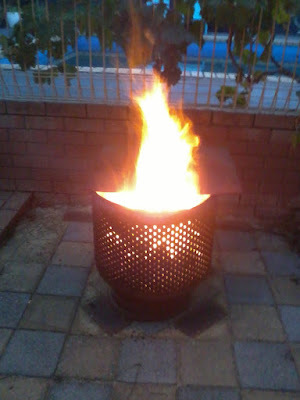 Our fire pit is just a washing machine drum, we have had for years and works so well! We cooked dinner outside, toasted marshmallows and Mr 10 set up our telescope. It was a full moon as well so we got a great view. -Mr 14 helped bake some banana bread, honey joys and mars bar slice for treats during the week. Mr 10 also made spaghetti bolognaise one night for dinner using TVP. It was really delicious. My distressed table and chairs. Paint sample pots and DVD's from a friend. Silverbeet and rocket from our garden. 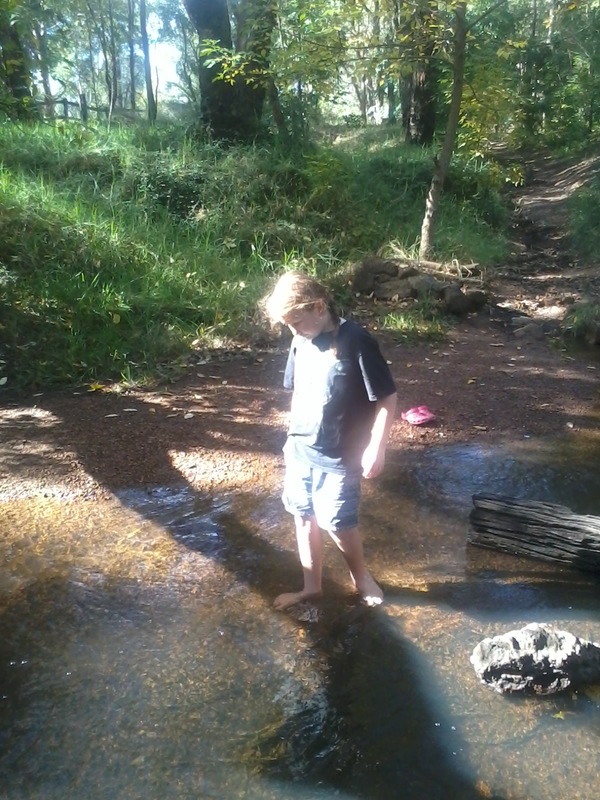 Mr 10 playing in the river. 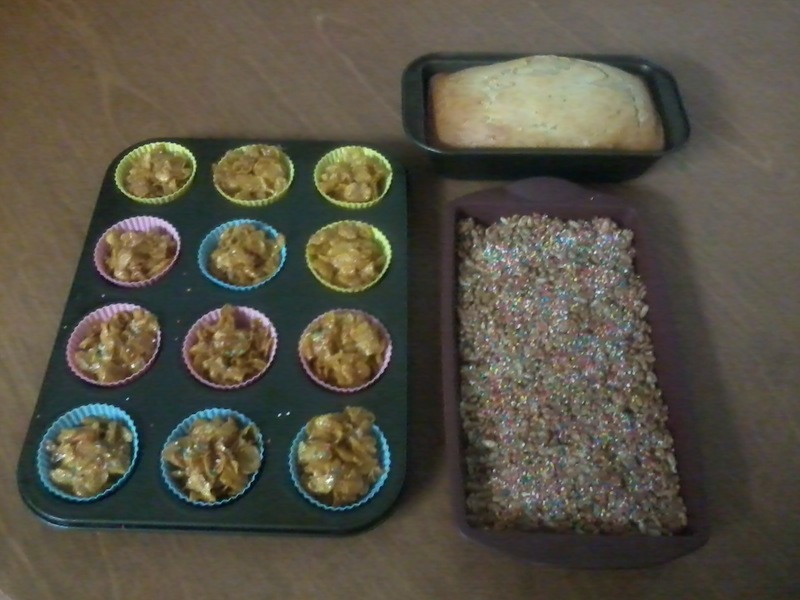 Honey joys, mars bar slice and banana bread. 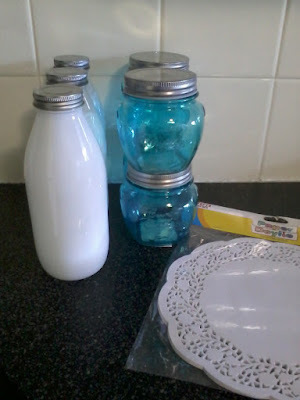 Bargain glass jars and paper doilies. 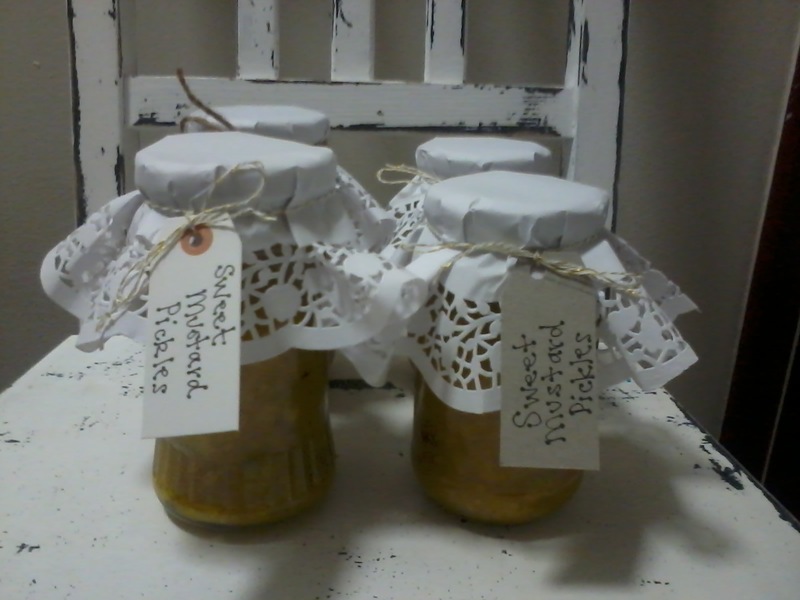 Pickles jars with doilie toppers. Mel, I love love love the distressed table and chairs. Well done. You have had a busy week. I also love the table and chairs! I love shabby chic, white, distressed... lovely job. A very productive week. The pickles look great and I do the same thing with the bread. Its amazing. I make a lot of "pizza subs" type things with bread rolls, garlic bread and so on. Very handy. Hi Mel! I too love the table and chairs...you did good lady! Those blue jars are just making me swoon...I'm a sucker for blue glass. That was sure sweet of your friend to gift you the dvds and the paint samples. I hope you have a great week!